The subcontractor receives material parts and manufactures the complete material.The subcontractor is paid an agreed price for the whole activity.The external processor performs a process step only. The material is processed externally and completed in-house.A price is agreed for the external processing. Example - Subcontracting: Bottlenecks are always occurring in the century section of your pump manufacturing plant. Because of this, you have agreed with a subcontractor who has the necessary technical capabilities that he/she will produce shaft 100-300 for $100 per piece. You provide blank 100-310 for the subcontractor, since you have to comply with a strict quality control for the raw material. Example - External Processing: In metal production, particularly turning and drilling, the materials have to be decreased before further work can be carried out on them. The decreasing of shaft 100- 300 after the "turning" work step is allocated to the external processor. The reasons for this are commercial and environmental. The material costs of the components delivered to the subcontractor. You can assign separate operations to an external supplier for processing.When an operation is processed externally, the data that is relevant to costing is maintained directly in the operation. You can use purchasing info records to maintain the data.You use the valuation variant in Customizing to specify whether costing uses the price in the operation or one of the prices in the associated purchasing info record. 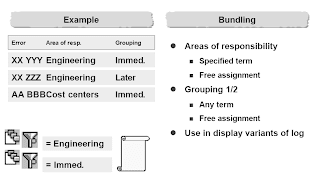 User-defined error management enables you to have an individual input on the error log of the cost estimate.For messages selected by SAP (in other words, not all messages), the message type allows you to define the message according to whether it is a warning, an error, or for informational purposes.Certain messages can be excluded from the error log. 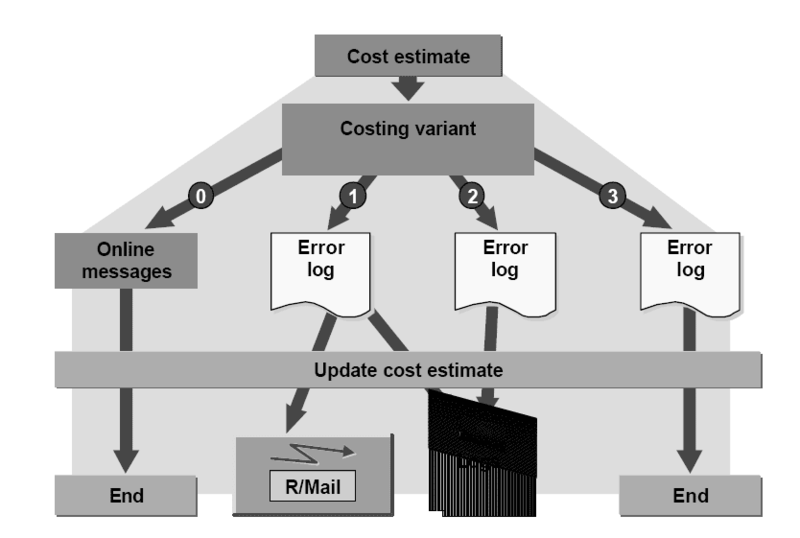 For this reason, the customer can alter the range of error logs.Recommendation: At the start of the implementation process, jump from a log to Customizing for User-Defined Error Management. Once you make the changes in Customizing, these will apply to all future logs. 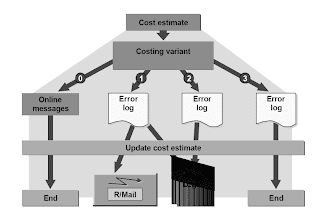 n Error management and analysis gathers the messages of an application in one log. 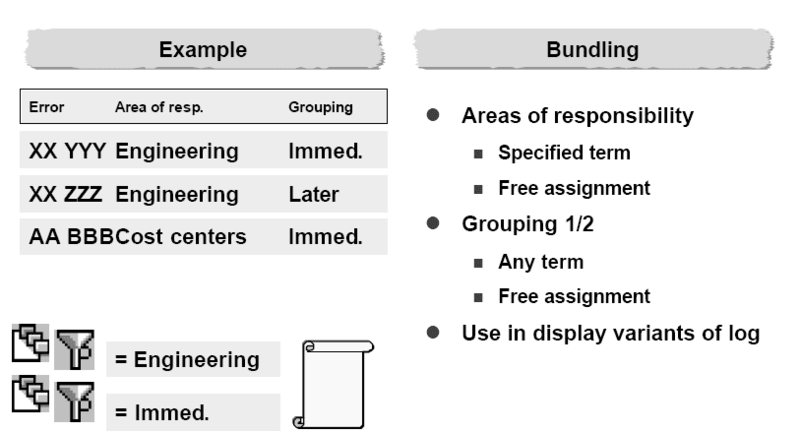 This log can be displayed or analyzed according to certain criteria. If required, you can send the log to the person responsible by means of the message control.  Assign error messages to those responsible (roles, partners) in Customizing.  Make sure that the log is saved and that mail is active in the costing variant.  Go to the log. Select all or some of the messages and send them.The persons responsible assigned in Customizing automatically receive a message in their inbox.Recommendation: Use the procedure with display variants, since a sent error log does not contain any message long texts. Reorganization enables you to delete those cost estimates from the database that you have specified in the selection variant.Important:No archiving is carried out in this step.